I admit it, I LOVE china. Heck, I love dishes in all forms: china, glass, pottery it all somehow finds ways to come home with me. When I stop at flea markets or antique stores, I usually can’t resist the transparent white quality of an antique milk glass cake stand. And, depression glass in all it’s beautiful soft colors, I want it all to be mine! Often at tag sales, dishes are being discarded by owners who complain that they don’t have room for another dish. This equals great deals for collectors. Hobnail glasses can be scored for a couple dollars each at yard sales while pricey reproductions are available at upscale boutiques. The way I see it, a seller’s need to “declutter” is my collective gain. I embrace the delicate details, handpainted finishes and one-of-a-kind lost pieces from a larger vintage set. When grouped together, you can get the most remarkable display. Not every piece needs to match, but carefully curated. When grouped in a cupboard, it makes a beautiful statement in your home. 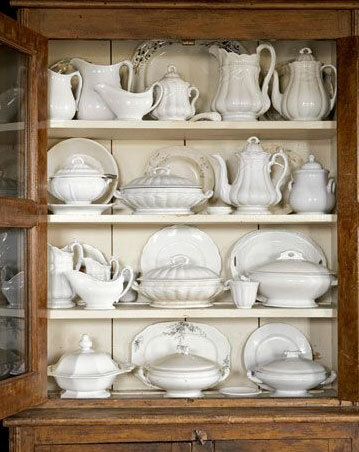 I have a special spot for antique Ironstone. My great grandmother collected it, and her collection has been handed down and added to by generations of Ironstone collectors. There’s nothing more ethereal than collected glass displayed in a glass cabinet. I collect everything from glass cake plates to antique etched wine glasses and luster carnival glassware. 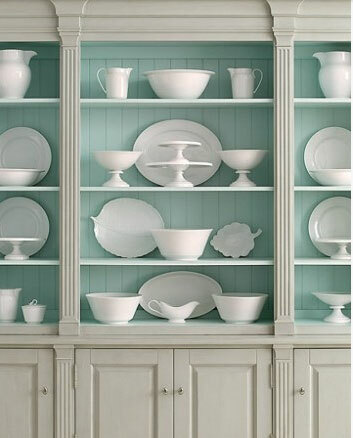 A beautifully culled collection of milk glass juxtaposed by a french blue and grey china cabinet…dish perfection! 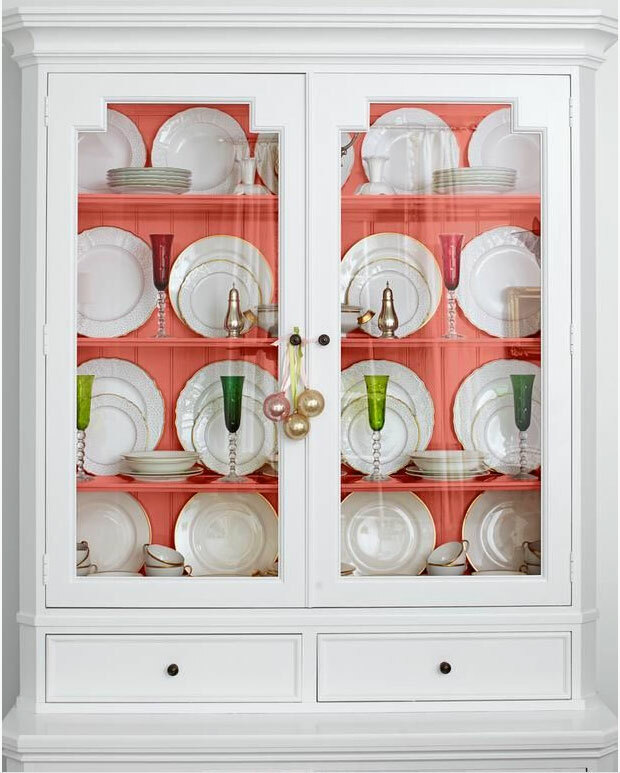 New wedding china, mixed with collected porcelain pieces creates “one visual mass” inside a glass cupboard. The painted salmon interior of the cabinet, provides the most beautiful complement to the simple gold rimmed dishes and emerald glassware. Now that I’ve amassed a collection, it’s time to get a great china cupboard to display my treasures. Below are some French Country Cupboards by KateMadison.com. Each can be painted (one of those fun colors above) or stained (allowing the dishes to be the star) providing a neutral background to your china and glass displays. 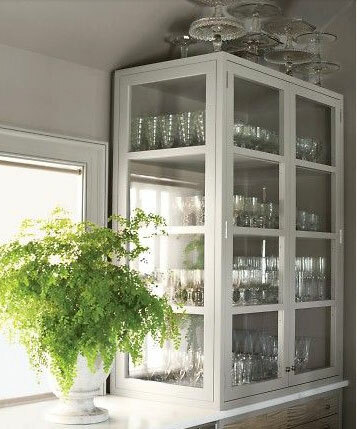 A corner china cabinet is a great use of space for that awkward corner in a kitchen. Imagine displaying green jadeite in this French Country Corner Cupboard by KateMadison.com. The traditional glass door storage will keep your pieces pristine. The open shelf provides extra height for a cake plate or a stack of bowls…or maybe just a delicious blueberry pie.